Happy Autumn Equinox! Today is the day when our day and night are in balance and also marks the first day of Fall. Also known as Fall Equinox and Mabon, today is traditionally a day of celebration for the harvests and the beginning of a new season. 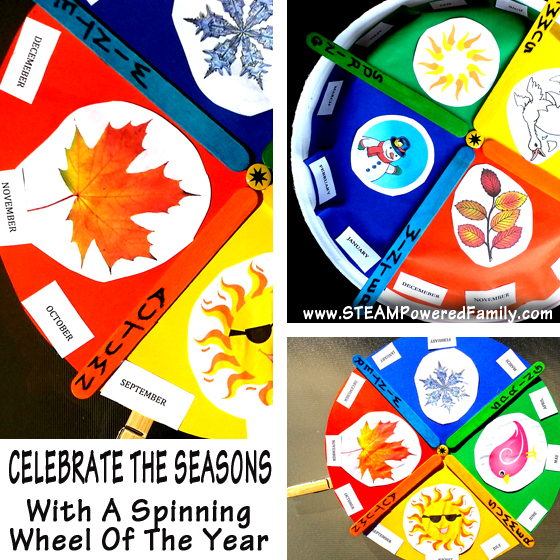 To help connect my kids more with nature and the changing seasons we are doing a week long celebration and today we made Wheel of the Year crafts that actually spin. This was a really fun way to learn more about the year, months and seasons. This craft was a lot of fun and can be done by preschoolers and up. Younger children will need assistance and use proper judgment when determining if any activity is suitable for a child. Paper Plates – Get the good thick and sturdy ones for the best spinning ability. Construction Paper – In 4 colours to represent your seasons. Coloured Craft Sticks – 4 Colours to match your seasons. Computer with printer or stickers with the month names and images. To start pick which colours will represent each season and set those coloured crafting sticks and construction paper aside. Each project will use 2 paper plates. 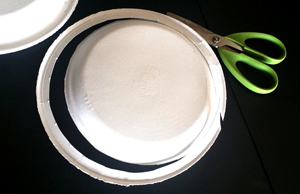 Take one paper plate and trim the edge off. Arrange your construction paper sheets into the order they will appear on the wheel ~ Spring ~ Summer ~ Autumn ~ Winter. Depending on the size of your paper and plates you may be able to quarter the construction paper so one sheet can be used on four projects. This is what we did. Now flip them over so it is reversed so you can work on the back side of the sheets. This is really important so you can keep the top of the sheets nice and clean. Now place a bit of tape on the sheets to hold them in place while you work. 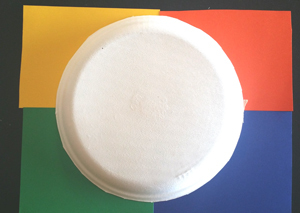 Take the paper plate you cut the edge off of, and measure the radius to find the exact centre. This became a nice little math lesson for my oldest as we worked out how to find the centre point. Using your measurement centre the plate over your construction paper (upside-down) then trace around the plate to make your circle. Cut out the circle from your construction paper. 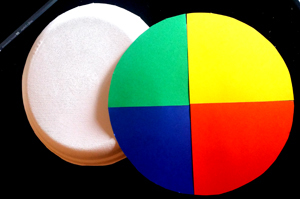 Again using your measurements to ensure it is centered, glue the cut out construction paper circle on the trimmed paper plate. You will be working on the plate upside-down. Here you can use your own creativity and either leave the paper flat or wrap it around the plate. We did both and they both look great. So it is really just a matter of preference. While that is drying write the seasons on your crafting sticks. Place the colourful plate on top of an upside-down full plate and secure them together with a thumbtack through the centre. For my older kids we found that was enough (you can bend over the end if you wish) but for younger kids you should add a safety stopper on the end of the tack. Glue your crafting sticks onto the paper so the stick comes at the beginning of the season. While this is all drying, head to the computer and type up all the months. Then either search for some clipart to represent your seasons or if you have some magazines you can cut out images from there. Or if you are very artistic you can hand write and draw these by hand. Print these out, then cut them out. Glue into place. For the final touch we added a clothespin to mark which month we are in. The best part, according to the kids, is that just like a wheel these spin! These will now be on display in our classroom where we can update them each month. 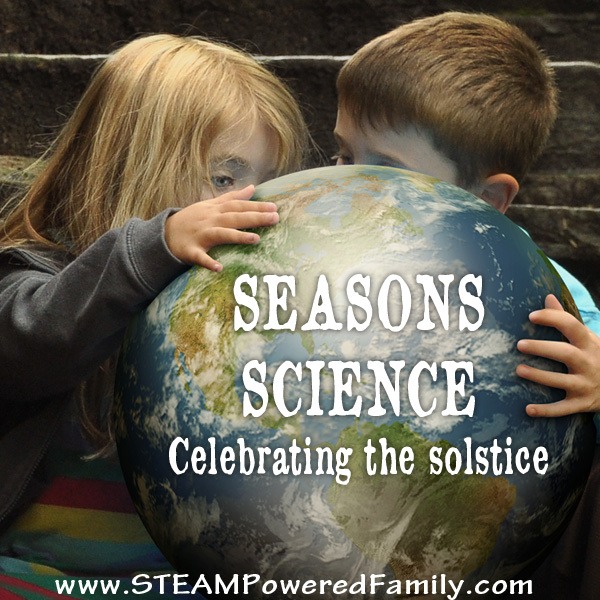 The kids are learning the months of the year, plus the seasons. 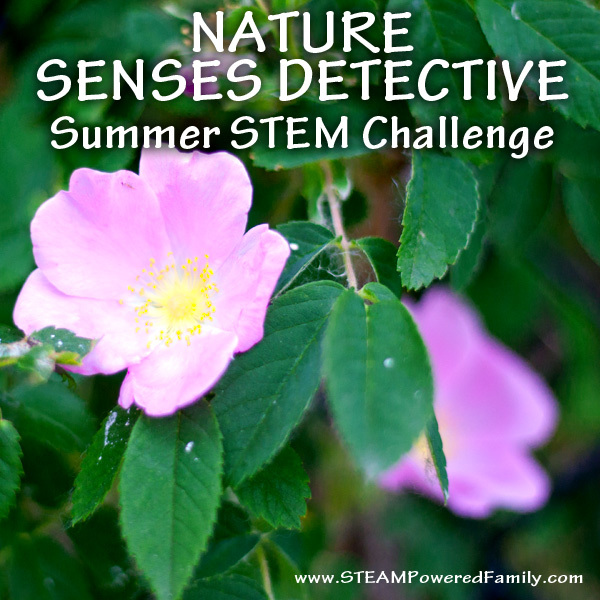 A great way to celebrate nature! Don’t forget to take a moment today to celebrate the Autumn Equinox and for other ideas check out the rest of this series. What a great craft and visual for children! 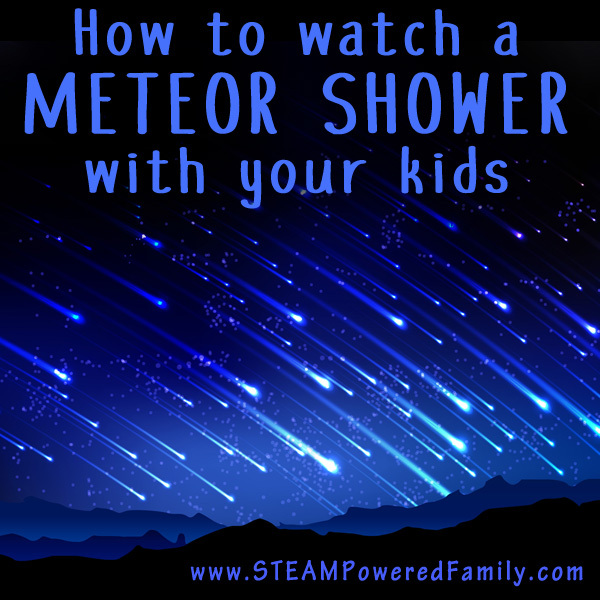 I plan to do this with my grandsons. We have had ours for over a week now and my youngest son keeps pulling it out to ask questions and play with it. I hope your grandsons enjoy it as much as my son does! GREAT IDEA!! I have seen season wheels that you can buy but they are always so boring and general. I love how personalized these were made! Wonderful idea! Thank you for sharing with #made4kids. We hope you come back and share with us next week!! 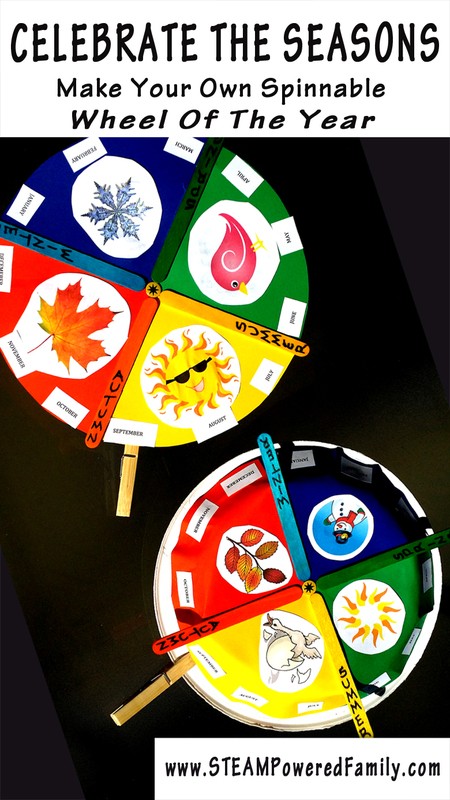 What a great way to help children visualize the seasons! And I love how bright and colorful it is too. Thanks for sharing at #made4kids!